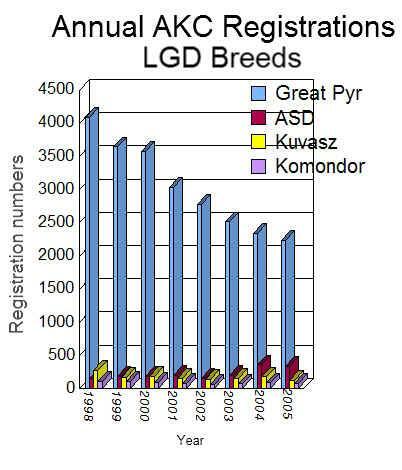 Every year, I update some spreadsheets with some AKC breed popularity statistics and post some of the highlights on my website. I've updated my online copy of the OFA database of ASDs. 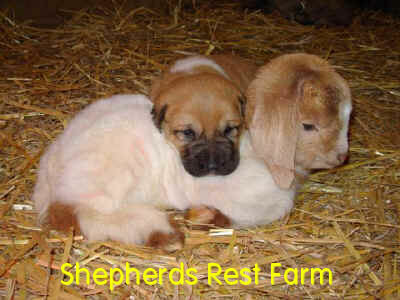 These are dogs which have public health testing results available at the OFA site. 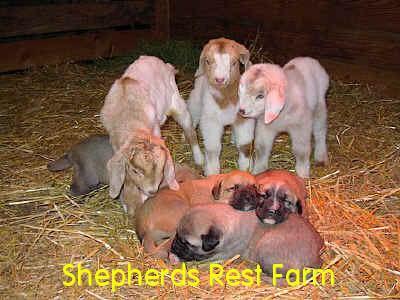 Cardiac, thyroid and CERF are among some of the tests that some breeders or Anatolian Shepherd Owners have done. In six months time, there have been 49 additions to the database. This doesn't mean 49 more dogs were tested, but that some dogs with multiple tests were added. If researching an individual dog or a kennel name to get background information on the ratings of their dogs, the alphabetical layout of the reports is pretty helpful. I note that some names are misspelled and others have been corrected. 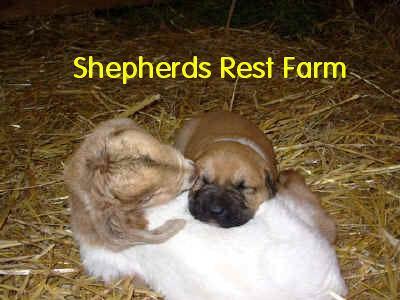 From over at Shepherds Rest Farm, a few amazingly CUTE photos. I'm tellin' you, is this CUTE or what?! Go there and visit NOW! For working dogs and companion dogs. 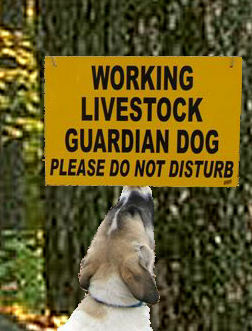 Working dog for sure! Makes his own signs, I see. 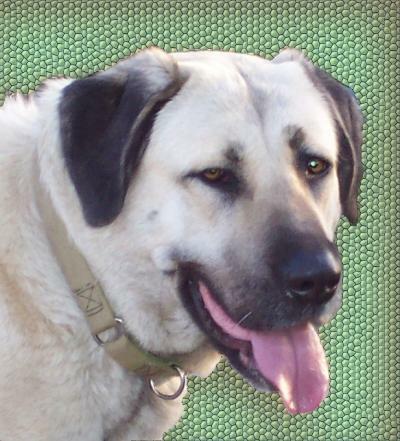 A month ago, we heard about a handsome young Anatolian named Stuart was living in the Sacramento, California area who needing a new home. 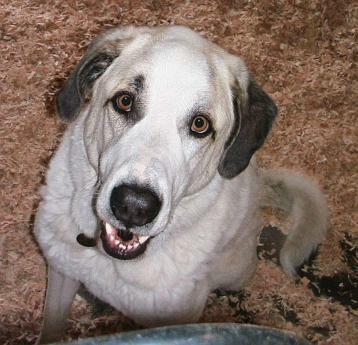 He has been adopted and appears to be adjusting to his new home on a beautiful southern California ranch, with horses, sheep, chickens, a menagerie of other critters, including cats and other dogs -- among them, an older Anatolian male that the owners also successfully adopted years ago. He's learning some new roles and rules everyday and it sounds like he is going to settle right in. His new owners know that like any rehome, he needs patience, understanding and time for him to get acquainted with his new routines. Great looking dog. Glad things worked out and he has people caring for him. About a month ago, I was just minding my own business and catching up with an onslaught of email when I got a post that mentioned an apparently secret, technique of doggie urine collection for a medical exam. I understand from the exasperated owner that the dog regarded the container in the owner's hands very suspiciously and would only do her thing when the coast was clear. Unfortunately, this was not captured on film. So the method, while a success, is still something of a secret. Other doggie fun from the same source... Here we see Brinks possibly telling another ASD that she knows where her tickle spots are. Brinks is the one in the pink collar, and Maggie is the bigger girl (aka Chew Toy) who looks a little worse for the wear. 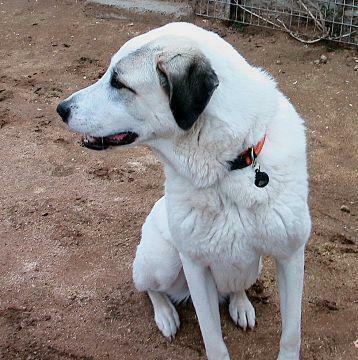 You can visit Gypsy Anatolians homepage for more photos of these and other beautiful Anatolians. Woof! 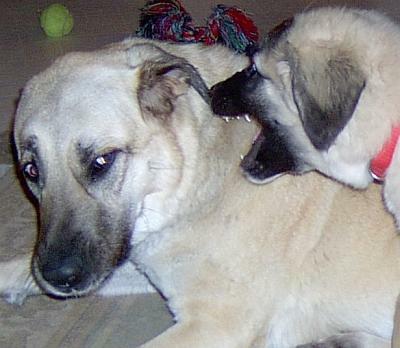 Isn't it always the case of the older ones having to let the younger ones chew on them? True! The young ones get away with an arrrful lot for a while! Til the big guys think it is getting a bit old! That is a hilarous picture. You should run a caption contest. Now that's an idea! Need to come up with ideas for prizes.